FARGO, N.D. — Fargo-Moorhead scored three runs in the opening five innings of Sunday night’s series opener against the Chicago Dogs and got another great outing from Will Solomon to secure a 3-1 win in front of 3059 fans and pick up a half game in the North Division playoff race. The RedHawks remain four games behind the Gary SouthShore RailCats for the final North Division playoff spot with eight games to play. The Hawks jumped on Chicago starter Josh Goossen-Brown early, scoring a run in the first inning when Tim Colwell led off with a single and eventually came around to score on a sacrifice fly from Leo Pina. Brennan Metzger and Devan Ahart combined for back-to-back doubles in the third inning to double the home side’s lead, and a sacrifice fly from Ahart in the fifth brought in Derrick Fox to make it 3-0 RedHawks after five innings. Solomon was on fire on the mound, striking out seven Dogs and allowing just one run over seven innings in his 19th start of the year. The left-hander moves to 10-7 with a 4.18 ERA for the season. 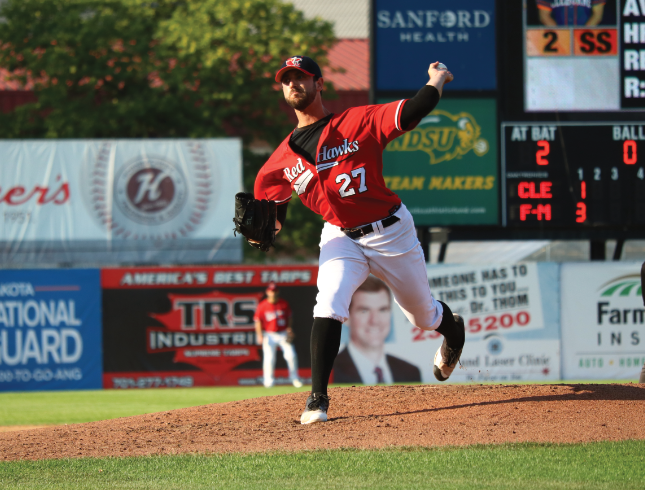 Benji Waite induced three straight ground ball outs in the eighth to hold the Fargo-Moorhead lead to two runs, and Randy McCurry struck out the side in the ninth inning to earn his 16th save of the season. With Gary not in action tonight, Fargo-Moorhead picks up one half game in the North Division standings and now sits four games behind the RailCats for the final playoff spot in the North. The RedHawks will look to continue their playoff push in the second of three games against Chicago at Newman Outdoor Field. First pitch is scheduled for 7:02 PM and all fans will receive a RedHawks team photo thanks to our Maury Wills Knothole Gang sponsors.